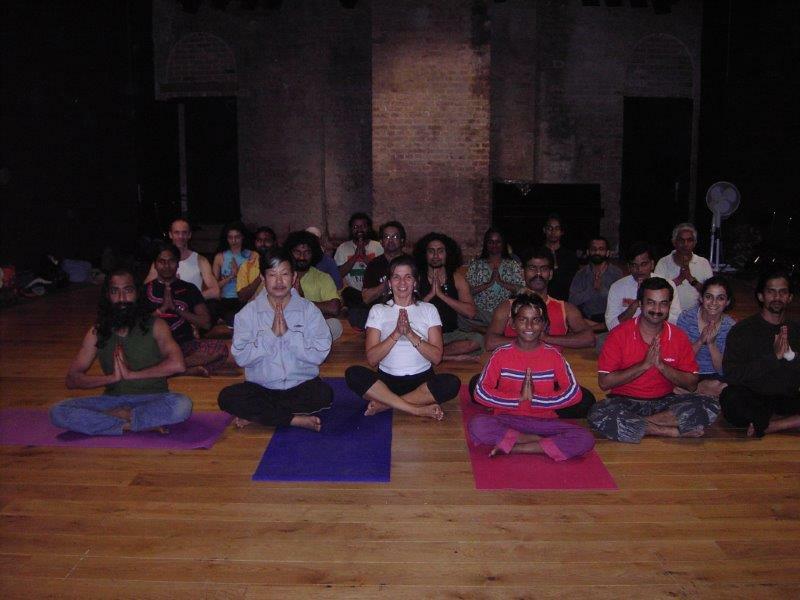 In the spring of 2007 I received a call from Tim Supple, the director of a group of actors from India and Sri Lanka, looking for an Iyengar yoga teacher to keep the group in top condition. The group was due to perform "A Midsummer Night’s Dream" in the UK, a play that has endured well in all languages of South Asia as to be the most performed Shakespearean play there. Tim’s adaptation to the west is a visual feast of dancers, acrobats, singers and well known actors performing together in different languages. Dialogues and scenes exploded in front of peoples’ eyes, difficult and mesmerizing rope work was performed by acrobats while performing perfect Padmasana. All this against a colourful and dramatic back ground (an Indian scaffolding). The preferred medium of transference for Shakespearean drama in India has always been the adaptation to which Tim has done justice. I was very lucky to see the play a few times. Because of the intense rehearsals and some minor injuries they were in need of some stretching and focus. Tim felt the Iyengar method to be the most suitable, having done Iyengar yoga before and some of the members of the cast having done Iyengar yoga in India. The group consisted of 20 to 30 members of the production: performers, dancers, musicians and acrobats. Tim often attended the classes when he was not busy with meetings and interviews. Most of the members of the group are men, with 5 women and 2 children included; some very flexible and some very stiff and stressed. Dharminder Pawar (glow worm spirit) and his 2 small brothers come from a traditional acrobat family from Pune, Archana Ramaswamy (Hippolyta/Titania) is a trained classical dancer, Palani (cobweb spirit) has spent his entire performing life either dancing or defying gravity, Jijoy (Theseus/Oberon) is trained in various forms of martial arts, Padmakumar (mustard seed spirit) trained in Kerala martial art form Kalarippayat, to list just a few. For me, teaching such a group was a wonderful and challenging experience first of all because not all of them spoke English. The play was performed with bits of English and various South Asian languages and dialects: Tamil, Malayalam, Hindi, Bengali, Marathi and even a smattering of Sanskrit. I called the name of the asanas and demonstrated them and was very strict, Indian stile. Sometimes some translation was necessary, especially to the 2 children Ram and Lakhan, but as soon as they understood what was to be done, they did not need much encouraging as they both come from a family of acrobats and are very supple and agile. On the other hand some of the members of the group were suffering from back problems, some had knee pain, one had an unexpected operation, Gopalji’s wife back in India just had a baby so he was not very focussed in the practice but feeling extremely happy never the less. With such a mixed group I followed Geeta’s Preliminary Course, starting with lots of arm work, followed by standing poses. They particularly enjoyed balancing asanas, Vrksasana, Ardha Chandrasana and Virabhadrasana III. Sitting asanas and some back extensions were introduced later. I did not teach them inversions for the lack of equipment. After a few sessions the men asked for some asanas to help reduce the increasing size of their abdomen due to the change in diet, so the 2 Navasanas and Urdhva Prasarita Padasana were introduced to their delight. The sessions were an exchange of knowledge, I taught yoga asana and they taught me how to pronounce the Asana name: Asana is pronounced aa-sana, Tadasana becomes Taadaa-sana, Trikonasana sounds like trikonaa-sana, though they did not have any problems with my pronunciation of Svanasana. After 6 weeks of performing at the Roundhouse the group returned to India for the summer for a much needed rest. At the beginning of September, they returned to tour other places in London and the rest of England. I was asked again to teach them while they were back in London. I also went to Watford, Richmond and other places, always very happy to see them as they were all very interested in learning, kind and warm.